Annuity payouts are being trimmed roughly 10 percent, a trend that will continue this year as insurance companies adopt new mortality tables showing people are living longer. Because insurers have to offer guaranteed lifetime payments for additional years, they feel forced to cut payouts to remain profitable. The key question: Is this as bad as it seems? The answer: Maybe not. This is because there is a decent chance that some or all of these cuts will be reversed late this year or in 2017 if Federal Reserve-engineered increases in short-term interest rates translate into increases in long-term interest rates. This is usually the case. This would prod insurance companies, flush with higher profits from the bonds in which they invest, to increase payouts to offset sluggish sales. Right now, this scenario looks certain to be delayed because the economy is underperforming. It is still likely to happen at some point, however. In the interim, most prospective annuity buyers shouldn’t wait to buy annuities, especially given dour stock and bond market prospects. Annuities still pay considerably more interest than bank CDs and are virtually as safe. But instead of following the conventional path of buying a traditional lifetime income annuity at this juncture, prospective buyers should instead seriously consider building a ladder of fixed annuities with different maturity rates. These offer respectable income while the ladder hedges, in part, against the risk of rising rates, buying time until lifetime income annuities offer higher rates. New mortality tables show that 65-year-old men, for example, are living three years longer than they did in 2000 (to 88.5 years) and 65-year-old women more than two years longer (to 90.3 years). Annuity payouts have already been declining for years, largely because of a sharp drop in interest rates. Mortality table-induced adjustments last year and this year, however, will mark the deepest and most widespread cuts since 2008. At least the necessary cuts are coming at a good time. There was almost no hope of rising annuity payouts before the Federal Reserve increased interest rates in December for the first time in nine years — a necessity preceding an increase in annuity payouts. With a lag, to be sure, market observers say long-term rates should start rising and offer relief against mortality table-related payout cuts. In the interim, consideration of a ladder of fixed annuities – specifically, the Multi-Year Guarantee Annuity (MYGA), should enter the picture. In addition to paying more than CDs – generally 2 percent to 3.25 percent annually for three to 10 years – taxes on the interest are deferred until withdrawal in a non-IRA account, allowing the annual yield to compound and grow more. An investor could put equal amounts in, say, a three-year, five-year and seven-year MYGA, which, at current rates, pay 2 percent, 2.65 percent to 2.8 percent, and 3 percent respectively with the option to withdraw 10 percent of your principal. This provides a partial hedge against the uncertain timing of rising interest rates. If, say, rates rise after three years, you can transfer the money that was in the three-year MYGA into a lifetime income annuity as a non-taxable event, and then, with a lag, do the same thing with the five-year and seven-year MYGA. For those who need more current income, perhaps because they are at least 70 years old and have to pay Internal Revenue Service’s Required Minimum Distribution (RMD) on their IRAs and 401 (k) plans, the best route today may be the purchase of just a seven-year MYGA. It pays more, similarly allows withdrawal of 10 percent of principal annually without penalty, and, down the road, and offers the option of transfer into a higher-paying lifetime income annuity. Another alternative for some is the purchase of a universal life policy with an equity index feature. This would make as much sense as a MYGA ladder, perhaps more, if the prospective buyer has at least $100,000 to invest, is in good health and wants a shot at index appreciation. Some of these products offer as much as a guaranteed annual interest rate of 3 percent (minus fees of about 1.5 percent, netting the same return as a 2-year CD) and a high ceiling of up to 12 percent annually on the S&P 500 stock index. More people would probably prefer the MYGA ladder option because it offers higher rates and the interest rate hedge. Insurance companies will increase annuity payouts when interest rates rise because sales have been mediocre. 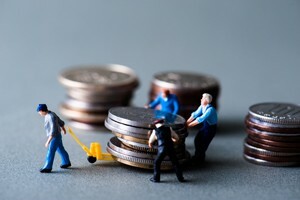 In the first nine months of 2015, the latest figure available, total annuity sales totaled $169.6 billion, down 2 percent from the same period in 2014, according to the Insured Retirement Institute. In healthy years in the past, such as 2006 and 2007, annuity sales rose 10.3 percent and 8 percent respectively. Insurance companies want to see these kind of increases again, especially because Baby Boomers are retiring in record numbers. If there was ever a good year to be a creative investor, it is 2016. The stock market is highly volatile and heading south. Interest rates on bonds are deep in the basement. And while annuities pay better, an annuity buyer today may well come to regret today’s rates in the future if rates eventually rise, as it likely, and he or she finds themselves forever stuck with a subpar income payout. To help illustrate how people in retirement or near retirement can better navigate today’s financial shoals, here is brief look at the two different strategies deployed by two parties — a hypothetical couple (65-year-old Robert and Susan Cohen) and a hypothetical man (60-year-old William Esposito, who is single). The Cohens have $500,000 to invest and originally wanted to buy an immediate annuity – an annuity that pays higher lifetime income, some of it tax-deferred, in exchange for sacrifice of principal. The problem is that immediate annuity payouts today are depressed, along with all annuity payouts. So the couple has decided to postpone the purchase of an immediate annuity. One purchased today would fetch $28,000 annually. Their annual annuity income goal is $33,000. For a while, they will make do with $9,000 a year less than their income goal by trimming living expenses and making higher withdrawals from their stock portfolio. Instead of buying an immediate annuity, they will create a ladder of three different Multi-Year Guarantee Annuities (MYGAs) – the most attractive fixed annuity. Specifically, they will invest $300,000 in a five-year MYGA paying 2.9 percent, and $100,000 each in a six-year MYGA and a seven-year MYGA, paying 3.05 percent and 3.25 percent a year respectively. After five years, the Cohens intend to invest the $300,000 previously in the five-year MYGA, plus interest, in an immediate annuity paying higher rates than today, getting them closer to their $33,000 annual income goal. When the time comes, they will do the same thing with their six-year and seven-year MYGAs and, hopefully, finally accomplish their goal. There is no guarantee that things will pan out exactly the way the couple wants. But the ladder will substantially increase the odds. While it will generate less money than an immediate annuity, it positions the Cohens to buy a higher-paying immediate annuity in the future, when interest rates are highly likely to be higher. And it accomplishes the couple’s greatest financial goal of all: Maximizing the odds of staying ahead of inflation over the long term. Esposito, 60, needs a bridge to age 66, when he will begin collecting Social Security. Specifically, he needs at least $500 a month for six years, in addition to his salary, to pay off his home mortgage by the time he retires. He has $1 million in financial assets, but wants to keep $600,000 in the stock market, convinced it will be higher by the time he retires. He plans to take the other $400,000 and invest it in an indexed universal life policy with an equity index feature. This will generate at least $6,000 a year and maybe much more. The product Esposito is looking at offers a guaranteed annual interest rate of 1.5 percent annually after fees and a high ceiling of up to 12 percent annually on the S&P 500 stock index, whichever is higher. Unlike annuities, he can get out of the product at any time without penalty and then, if he wants, use the money to buy a higher-paying lifetime income annuity. Esposito can’t miss his goal and may do far better. Over four decades, the S&P 500 has returned an average of 7 percent annually over every rolling five-year period, which in Esposito’s case would amount to roughly 5.25 percent a year after fees, or $21,000 a year. He may not earn this much, but he likes the odds.